Champion swimmer Michael Phelps has just won his 23rd Olympic medal, leading Team USA to a gold finish in the 400-meter freestyle relay at the Rio 2016 Olympics. Phelps, a last-minute addition to the event, gave his team a second-leg cushion that his fellow US swimmers didn't relinquish. In turn, he got himself a record 19th gold medal. But that isn't the main reason the 31-year-old is hogging headlines as of late. Prior to the 200-meter butterfly semifinals, the swimming legend was spotted shooting what could be the sharpest dagger look ever to his South African rival Chad Le Clos, who cost him the gold in the same event at the 2012 Summer Games in London. Phelps' Game Face: ON. 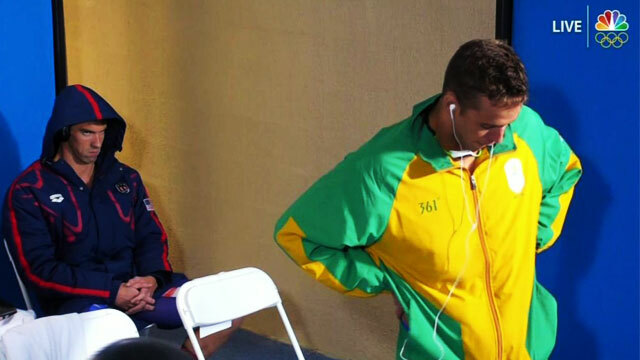 It was as if Phelps was ready to pounce on a prancing and—interestingly—shadowboxing Le Clos right in front of him. A death stare as intense as this was truly worthy of memes, and the Internet didn't disappoint. 4) Playing Pokémon GO while living in a rural area aka "the middle of nowhere"
10) Cashier asks, "Sir, may smaller bill po?"